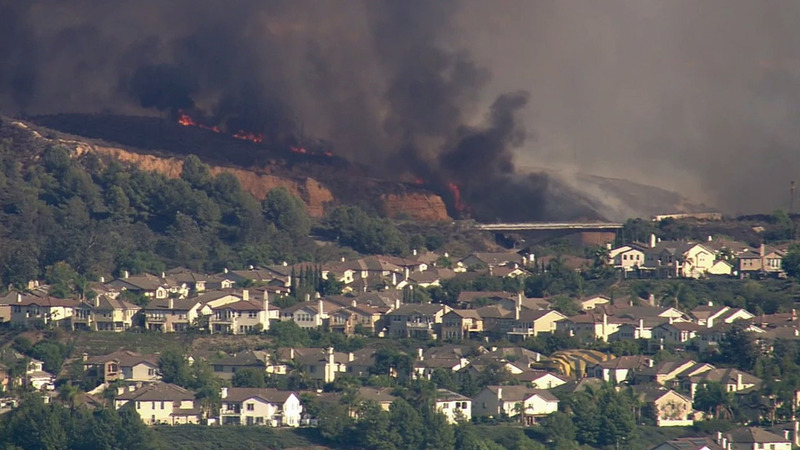 LA HABRA, Calif. -- Evacuations have been lifted for about 40 homes in a gated community threatened by an 80-acre brush fire in La Habra near the Fullerton border. The fire, dubbed the Risner Fire, was 70 percent contained. The gated community on the Los Angeles County border was temporarily threatened by the flames, authorities said. Forty homes were evacuated on St. Andrews Avenue, and Rivera and La Costa courts. Several nearby streets were placed on alert. #RisnerFire TO THOSE EVACUATED: You may return to your homes. There is an ID checkpoint at Sandlewood/Idaho to check for residency. The Red Cross opened an evacuation center at the La Habra Community Center at 101 W. La Habra Blvd, but closed it about four hours later. The fire was reported near Idaho Street and Risner Way at about 4:15 p.m. Los Angeles County firefighters worked to put out the blaze in the triple-digit heat with assistance from the Orange County Fire Authority. Fire officials said the spread of the fire slowed down because it burned light brush and grass. Los Angeles City Fire deployed one helicopter to aid in the fight and two Super Scoopers were requested.